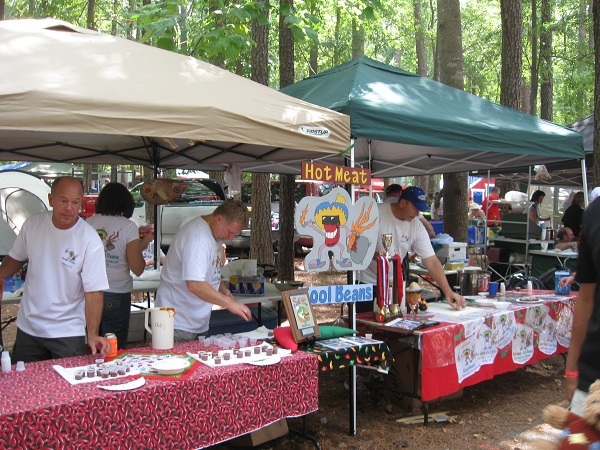 The Great Miller Lite Chili Cookoff, Stone Mountain GA – Marie, Let's Eat! 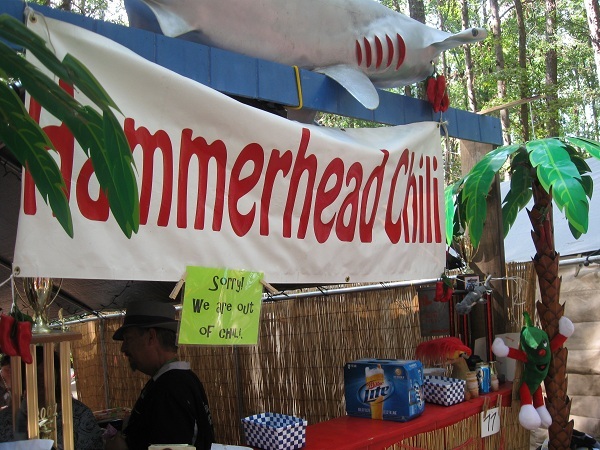 One of the many high points on the local food calendar is a wonderful chili cookoff, sponsored by Miller Lite and benefiting Camp Twin Lakes, that is held every September at Stone Mountain. Randy first told me about it three years ago. He was staying in Dacula at the time; the kids and I went and got him, learned that there is nothing that resembles a simple path to get from Dacula to Stone Mountain, marveled at the spectacle and the festival atmosphere and ate our weight in chili. The following year, Marie had moved in, and the two of us took the kids for another afternoon of overeating. There were 300 vendors; to sample one ounce from each of them would mean 2.34 gallons of chili, and that’s before you consider that a little over half the vendors also cook up some stew, and some of them cook up more than a single variety of chili. There are also food tents, evidently because some people really want to pay ten dollars to have all the chili they can eat and also buy a catered barbecue sandwich from Sonny’s. Three bucks for some roasted corn, now that I can get behind, but not a big paper plate of enchiladas and rice. I understand this place is a lot like a carnival, but there’s common sense involved. We didn’t go in 2009, because they forecast rain and I didn’t want to risk it. I spent that whole weekend being grouchy since the metro area might have received sixteen raindrops that day. This past weekend, I was bound and determined to make it back. The weather cooperated, but Marie’s job didn’t. She got called in for a Saturday morning meeting. The vendors and contestants start serving at 11, but Marie and our friend Samantha and I didn’t make it into the park until almost one, by which time the parking nearest the meadow where it is held was completely full, and so were a good half of the 15,000 people who came to eat hearty. I have to say that this was the first year that I was a little disappointed in the experience, although I did enjoy some really good tastes along the way. There were notably fewer contestants this time out. One vendor told us that he heard that there were only 250, down from 300 the last several years. This was borne out by the results, which indeed showed 249 entrants. Unfortunately, the organizers did not use the full space available – a “back row” on the far side of the shady meadow lanes was simply not occupied – and so this meant that more of the 15,000 visitors – that number up a little from previous years – were pressed into a smaller space. Plus, with more guests jockeying for chili from fewer vendors, plenty of people ran out quickly. We got our first taste about ten minutes after 1 pm, by which time a good quarter of the contestants had already ran out of the four to six gallons of chili that they’d each prepared. The lesson learned here is to make damn sure you arrive early. The event opens at 10, and the vendors are told to be ready to serve at 11. If we make it back next year, we will have spoons in hand at five till. Ever since I started telling people about this event, I have been asked the most remarkably idiotic questions about it. My favorite has been “What kind of chili do they have?” At least four people have asked me that. Well, “they” are, this year, 249 different people or groups offering up 249 different recipes for chili, using every ingredient from celery to venison. It’s a cookoff, not a restaurant. I didn’t think that was very complicated, but you never know about people. Each guest gets the opportunity to vote for their favorite chili. We all agreed that this year, Mike & Terry Metzler’s Grateful Red Chili was our favorite. They placed # 35 out of the 249 entrants. The winner was the Howard Crew’s Chili and Stew, which I recall also enjoying. Another one that I really liked, and which almost stole my vote from Grateful Red, was Cousins Chili, which placed # 17. In the Brunswick stew category, my favorite was The Hall Brothers, who placed # 55 out of 152 entrants. The overall winner was Bob Sims of Dos Gringos. There are several vendors who come every year, and I suppose, now that I’m looking back on this, I might have done a considerably better job of reporting on this escapade had I actually acted like a reporter and interviewed one or two of them. 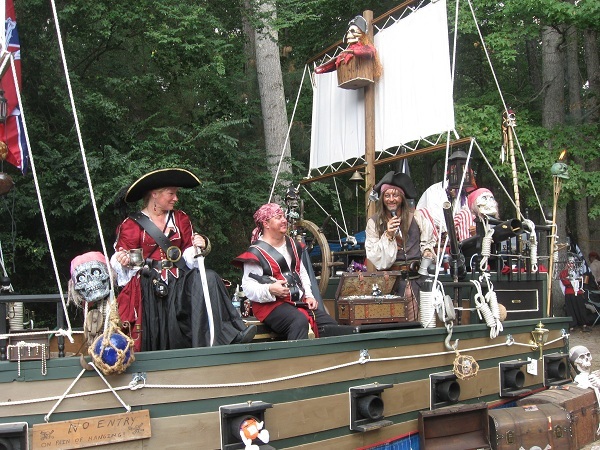 Some of the regulars, like Pirates of the Chili Bean and Trailer Trash Chili, go all out with elaborate booths and costumes and play to the crowd with several friends in character participating in the madness. Most of the others, it must be said, prefer to kick back on lawn chairs and watch the football games and socialize while members of their group take turns greeting the public and passing out the little one-ounce chili cups. Still, with all the garish booths and hoopla, the overall effect is somewhere between a state fair and Dragon*Con. Within two hours, we were spent and the vendors were wiped out. Only a very few still had any food left, although there was still music to enjoy. The event books four bands for each shindig, each of which are cover bands that specialize in classic rock recreations. To my mind, this is not an event where you wish to be booked last on the bill, by which time the chili is gone and the visitors are departing. Two years ago, I was curious to see a Paul McCartney “tribute” called Band on the Run, but they weren’t going to take the stage for almost three hours after we finished eating. This time out, we arrived while an Eric Clapton “tribute” called Slowhand was playing, and left as The Alabama Blues Brothers were finishing their set. I mention this because one of the vendors, and, confirming my slack job at reporting, I didn’t note which of them, really got into Slowhand’s set. I enjoyed some wonderful chili and stew and love spending time with Samantha and with my gorgeous wife, but I think the memory I’ll take most from this cookoff was this one guy singing along to “I Shot the Sheriff” with his own take on the lyrics… “I cooked the chili / But I did not cook the Brunswick stew!” Fellow almost got my vote over Grateful Red for that line alone. Posted on September 29, 2010 August 27, 2017 by Grant G.Posted in chiliTagged chili.